Let’s face it, there are two truths when publishing your own book. One, you need an eye-catching cover. Two, cover designers and design software can be expensive. Also, learning how to use design software eats up plenty of your writing time. But you can make your own covers using software most writers are already familiar with: Microsoft Word. No, really. And, since my writing project this week has been designing the cover for my latest book, I figure now is a great time to walk you through the most essential steps of using Word to make a book cover. Now, one caveat before we begin: You must have a good sense of design to make a good book cover. If you have even the tiniest doubts about your “eye” for design. Stop now and either hire a designer or read up on the basics of design. Okay, I’m not going to take you step by step through every single nuance of how to do this (that would be an entire book itself). I will however, give you the basic steps, some hints and tips, and provide you links to some very helpful resources. First and foremost, imagine what you want your cover to look like. Consider the major images in your book, the mood, and what is common for your genre. For example, if you’re writing a horror novel, a cover full of pastel colors isn’t going to attract most horror readers. There are exceptions to every rule, but unless you “know” how to break them and break them well, stick to the rules for now. Sketch out a few ideas for your cover. You don’t have to have much drawing skill to sketch, just get a few basic ideas of what you want for your cover. Try to come up with at least three designs since finding exactly what you want for images can be brutal…it’s always best to have a few back-up plans. Find images for your cover. There are oodles of public domain images, but I’d stay clear of those since they can be of poor quality. If you find a high-quality one (300dpi or higher) and it works for your design, go for it. However, you’ll likely need to buy a royalty-free image. I prefer 123rf.com because it’s fairly inexpensive, offers great terms on usage and has a good selection, but there are many other royalty-free image websites. Warning: Before you pay for any image, read the terms of usage! You don’t want to find out you’re not allowed to use the image for a book cover after you’ve already plunked down your cash for it. Download comps of several images that could work for your cover. Comps are low-quality images (usually with a watermark) that are free to download. You can use these comp images to create cover mock ups. Only after you’ve settled on a cover design you like should you pay for the image. Once you pay, you can select a high-quality image without a watermark. Before you begin, plan on being patient. Word can tricky to manipulate and sometimes things just disappear. This is not a project for a day you’re in a bad mood. Also, plan on working on your cover in small chunks, say 30 minutes a day. This keeps your eyes fresh and prevents rushing through the project. You have the option of working on text or working on the image first. I like to start with the text. Do not just type out your text because you’ll never be able to move it around. Instead Insert a Text Box and type in there. To be able to move the box around, select In Front of Text (under Wrap Text in the Drawing Tab). You can either put everything into one text box, or create separate text boxes for your title, your subtitle, and your name. Creating more than one text box is a good idea if you want to move the boxes around within your layout – for example, the title centered at the top, but your name at the right hand corner. After you’ve typed out your title, subtitle (if you have one) and name, you can begin changing the size, the font, and the style. Beveling creates a clean look and setting the font to small caps makes the words easier to read. There are tons of options for bending your words (under Word Art), spacing out the letters (under Font, Advanced), and changing the colors (under Text Fill). A few key points for your cover’s words…Don’t get too fancy. The fancier the words are, the harder they are to read. Keep in mind that on retail websites your cover will be about 1 inch tall; at the very least, your title must be legible at this size. Unless you’re already famous, your title should be the biggest words on the cover, not your name. You may need to resize/stretch your image to make it fit. Pulling on a corner will maintain the image’s aspect ratio, Pulling on the top or side corners will stretch it out which can create some interesting effects. You may like your image, but maybe the colors just aren’t right. Within the Picture tab play around with Corrections, Color and Artistic Effects until you get something you like. Remember, the image will end up being only an inch tall when people are shopping so stay away from images that are too detailed, too dark or unclear. Continue to play around and manipulate. The Undo command (Ctrl-Z) is your best friend when working on a cover. If you do something you don’t like, just keep hitting Ctrl-Z until you undo whatever you’ve done. And, of course, don’t forget to save as you work. Note: The problem most people have with Word is having trouble moving things about. This is because when you first place something in your document, Word wants to lock it into one place (usually wherever the cursor is). To “liberate” your text boxes or your images, just remember to go to Wrap Text (in the Drawing or Picture tab) and select either Behind Text or In Front of Text. Hint: If you’re torn between a few cover mock ups, ask your friends and family, your blog followers, your social media pals which one they like the best. Be sure to make the image small (no bigger than 3 inches high) and ask the question, “Which grabs your eye first.” All your mock ups may be great, but you want to know which one draws the eye of shoppers! Unfortunately, you can’t upload a .doc file to self-publishing programs. You’ll need a .jpg. Trouble is, you can’t save files as .jpg in Word. So what do you do? You don’t. Go to a PDF to JPG converter. I’ve been using PDF2JPG.net and love it, but there’s other sites out there. Once the conversion is done, download it and you have your cover! If you feel like starting from a blank slate is too much, work from a template. DIY Bookcovers has some terrific templates (with detailed instructions), and Cover Design Tips. The Creative Penn also has some terrific instructions on designing covers in Word. Yes. 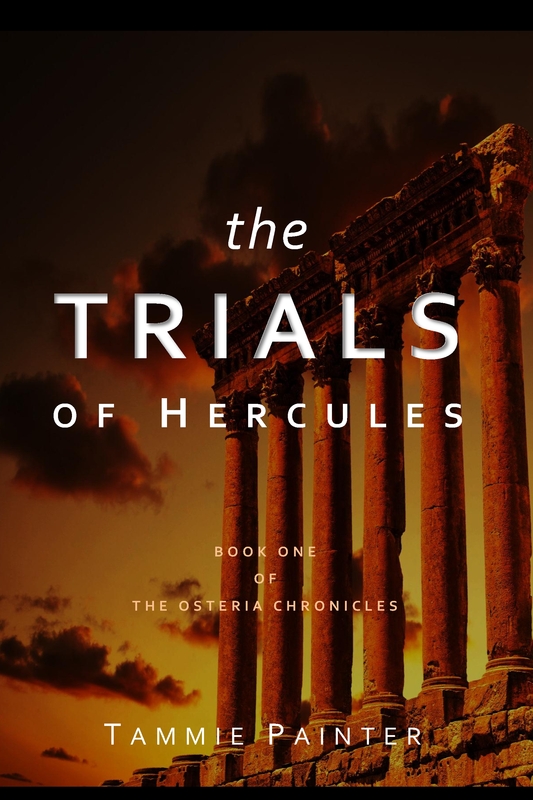 Using only the version of Word that came with my computer and one of the templates in the link above as a starting point, I created the cover for The Trials of Hercules: Book One of The Osteria Chronicles. Since this was the first in the series and I want the series to have a cohesive look, the Hercules cover will serve as my template for the other books. If you want to see the final results for The Voyage: Book Two of The Osteria Chronicles and learn how I changed a so-so image into something that worked perfectly for the mood and tone of the book as well as fitting it to the proper size for a cover, check back next Tuesday for the Cover Reveal (following this blog is the easiest way to keep up to date!). Thanks for reading everyone and have a great weekend! And if you have any questions regarding this post, please ask. I’m actually quite impressed. I came in here expecting to find a cover image that looks, well, that looks like it was made in Word, but you’ve created something quite fetching and did a great job of outlining how you did it in a manner that I think most people could understand. However, speaking as someone who has experience with graphic design programs (and no abilities as a designer), I can’t state enough how much of a difference it can make to get someone with a true designer’s eye to craft your covers for you. So many authors today (my past self included) have decided that their knowledge of photoshop was enough to get by with and have created some real eye sores. Also, find someone who is willing to be absolutely brutally honest with you to review any cover designs you make, whether made by you or someone else. All the same, some very useful info that shows the program isn’t as important as the artistic eye. Thanks for proving me wrong on what Word is capable of. Good point, Adam. Clearly, if the writer can afford it, they should go with a pro, but many are on limited budgets. If those with limited cash have a sense of design, they should take a stab at their own book cover since it can be fun. But, yes, I’ve seem some homemade covers that make me shudder and want to gouge out my eyes. And definitely get a cruel and critical eye to look over the cover (even a pro one)…I usually vet mine via my blog, LinkedIn, Twitter and Facebook, then take all criticism to heart when finalizing the design. Thanks for reading! This is a very handy guide for creating a book cover. I struggled with In-Design and Word would have been so much simpler. Thanks! Thanks James. I would have liked to go into more detail, but it’s one of those things where you just have to jump in and get your hands dirty. I’ve used a few graphics programs including some shareware and just find word to be more manageable for basic designs. Thanks leamuse! I think the key things to keep in mind when you try this are 1) keep all text in a text box 2) remember to put images Behind Text so you can move them around and 3) be very patient and willing to experiment. Good luck! Thanks for the heads up. I have tried Scribus, but found it more cumbersome to use than any graphics software I’ve ever had my hands on. I think by understanding the basics of using Word’s graphic capabilities (limited as they are) you can get by without too much trouble…or too many forklifts! However I do have some design background so I may have had an easier time than others understanding what is what. The problem is not the understanding of the concepts, but the quality of the export procedure and (most important) the accuracy when coming to place your design elements on the paper. You can’t rely on the positions, they will always drift around. It’s just a simple word processor and not a layout program. So far I’ve had not trouble with “drift” but that is something to keep an eye out for.